Driving into Aberdeen, Wash., we’re greeted with the sign, “Come As You Are,” from a song by the marine town’s local boy, Kurt Cobain. The verses that follow? As you were/As I want you to be. Aberdeen has always struggled with being, in any sense. The town now appears to be well-sunk, pulled down by the weight of dead logging and fishing industries. The downtown core’s empty storefronts offer “for lease” placards. Rotating signs spin half-heartedly in the wind, missing letters and customers. It’s enough to break a city girl’s heart. 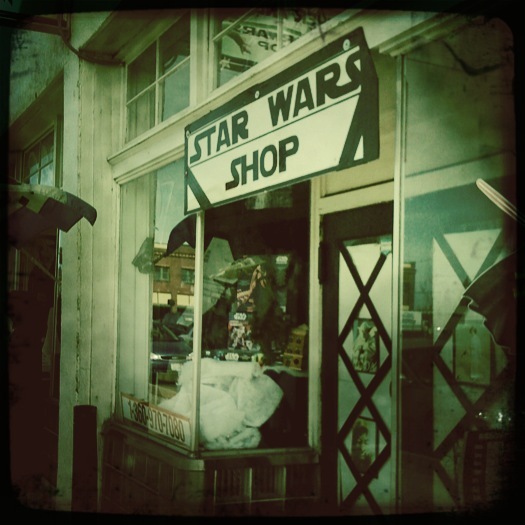 So what do you when Abderdeen’s grey skies and grey streets part and reveal the Sucher & Sons Star Wars Shop? Even if you’re not a Star Wars fanatic, you stop the car, amazed at the resilience of a desert flower. We walked in the door and found thousands of memorabilia laid out on tables, hanging from the ceiling, perched on sills. Some pieces with price tags, some tagless. It was like walking into a Star Wars hoarder’s home. A grey-haired man hurried to greet us. “Is this like, a private collection?” I ask. 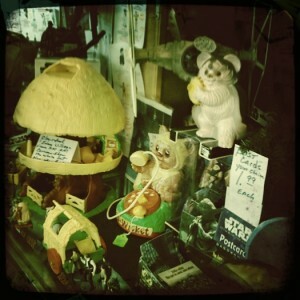 The kids dart off into the jumble corners of Star Wars hand-sized figurines and human-sized figures, Legos and Leias, model kits and magazine kitsch. “No, it’s all for sale. And this month, it’s all half off!” Don Sucher said, with a contagious smile. Of course, after poking around on the Internet later, I discover that the store is often half-off, and sometimes more. Sucher is a dealer in every sense of the word. 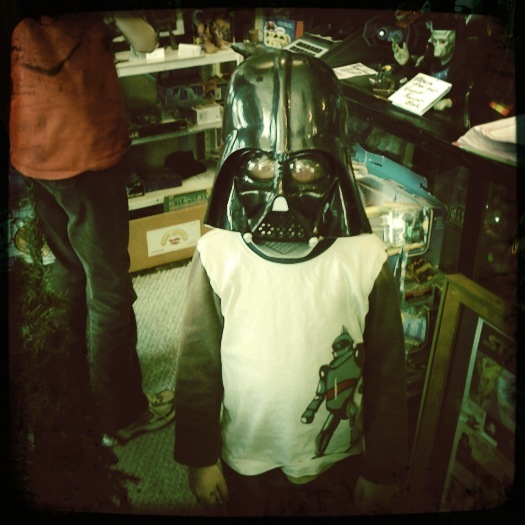 My son fell in love with a good amount of stuff – a Darth Vader Mask ($2), a Darth Vader figurine ($4) and a Darth Vader Light Saber ($20). 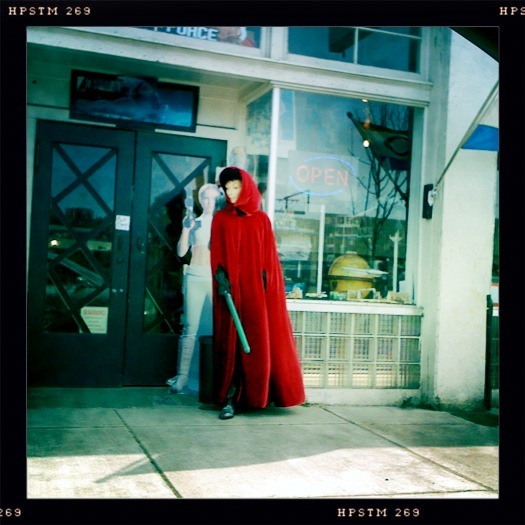 “It’s the right color!” my son shouted as the red-lit plastic saber growled and hummed. Sucher seemed inordinately excited over out-of-town customers. I wondered at how he could possibly keep such an enterprise going, even with Aberdeen’s low rents. Did he sell on eBay? No, he said, too much work. Ongoing media attention – and the fan visits that resulted — kept him in business. Newspaper clippings on the walls, from Japan and the U.S., seemed to support his statement, but I wondered at how I’d never heard of the store. It’s been here for 15 years. While Sucher may keep a $5,000 Millenium Falcon on display, his dearest possession is his tattoo. Carrie Fisher autographed his arm, years ago – and he promptly ran to the tattoo shop to get it permanently inked into his skin. Photos of The Arm decorate the store, and he loves any and every opportunity to pull up his shirt sleeve and show it off. My daughter dug through the back room of general collectibles and found a few Pokemon items. The back room also held Lilo and Stitch, Teenage Mutant Ninja Turtles, He-Man and My Little Pony items, along with dozens of old movie videotapes. After we finished up our oohing and ahhing and amazement over what-the-heck-it’s-an-Ewok-phone pieces, we went out to the car, where my husband was waiting. “You gotta go inside,” I insisted. “Why, is it cool?” he said. How to get there: 413 East Wishkah St., Aberdeen, Wash, about two hours from Seattle and 2 1/2 hours from Portland, Ore. Hours: Generally 12-5, but call him anytime (Phone: 360-970-7080s) and he’ll open the door. Come as you are. This post is happy to be part of DeliciousBaby’s Photo Friday. Visit Debbie’s site to find more deliciously different travel posts.